The Lost Hero, like the other Percy Jackson books, is a fantastic read about Greek and Roman mythology that’s impossible to put down. It’s the first book in a trilogy called the Heroes of Olympus. The story is about Jason, a demigod of Zeus who can’t remember his past, Leo, a child of Hephaestus who has a secret power of fire, and Piper, a demigod of Aphrodite with a way with words. After an incident at the Grand Canyon with a satyr and a few storm spirits, the trio is brought to a demigod camp called Camp Half-Blood by Annabeth, a distraught demigod whose boyfriend Percy went missing a few months earlier. At Camp Half-Blood, Jason, Piper, and Leo are chosen to go on a quest to find Hera, the queen of the gods, and free her with what little information they received from their camp Oracle, Rachel Dare, in form of prophecy. Along the way, they face many monsters back from the dead and different Greek gods, including King Midas and Aeolus, the weather god. Is Hera freed and the prophecy fulfilled? That remains to be seen by you! The story doesn’t end with this book, so I definitely recommend reading the other two and the Percy Jackson series that is set before these books. This series is hilarious, masterfully written, and a great way to learn about Greek mythology! 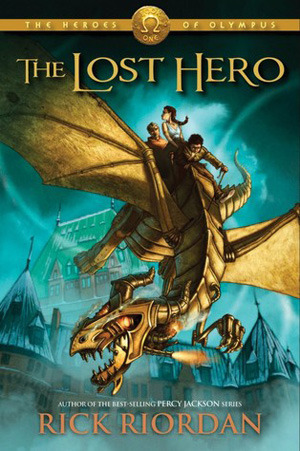 Rick Riordan’s The Lost Hero is available for checkout at the Mission Viejo Library. This entry was posted in Book Reviews and tagged adventure stories, greek, heroes, monsters, mythology, roman by kotlcbooklover. Bookmark the permalink. This review sums up the book very well! Great job!